Alexandra Walsh is missing, gone out to pick up tickets and then nothing, no contact, just gone. Jane Moore was once her best friend, but like a lot of friendships, life and events saw them separate. A chance meeting at a concert brings Alexandra's husband into contact with Jane, Jane's sister Elle & Leslie. After being trapped together in a lift, they decide they will help Tom to try and find Alexandra. Elle is a loose cannon, a liability but a fantastic artist who has many demons she needs to address. Leslie has lost so many of her family to cancer, she tested for the gene and has decided the best way to be safe is to keep a distance from people & family. This chance meeting will see them all come together and in helping Tom expose themselves to friendship and self exploration and personal growth. There is a lot about this story I liked, when someone disappears you want to know what has happened. Relationships forming and learning more about the characters, some happiness, some sadness and some laughter in between. 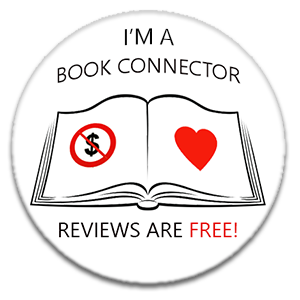 People coming together, growth of characters and vesting interest is always a great art created by some very talented authors. What didn't I like? There are themes of infidelity, some codes broken that as friends and or family you just wouldn't do, lines you do not cross. However, in saying that, it does happen and brings realism to the story, I still personally do not like it. Yet another good tale by McPartlin, I enjoy meeting and following the characters she creates. I really wanted to know what happened to Alexandra and getting to know the characters followed secondary to that. Once the story got kick started, you find yourself being drawn in and not wanting to put the book down so you can find where their paths are going. 3/5 for me this time, I will continue to buy up this authors work although my favourite still remains, The Last Days Of Rabbit Hayes. Mary Mackey has endured so much loss in her twenty-nine years that people call her 'Mary of the Sorrows'. Mary has settled for a humdrum existence, a life lived apart from the crowd. That way she hopes to avoid further grief. Her friends - Penny, Ivan and Adam - seem more together but they are just as damaged. Penny's loneliness, Ivan's cowardice and Adam's duplicity are all signs of lives going off the tracks. Mary, Penny, Ivan & Adam are our main characters, a close knit group. Mary has had her share of hurt and them some, Penny has a problem with alcohol but no one is calling her on it, Ivan has his own problems going on and Adam is married but in love and cheating with Penny. They all have things going on in their lives when Sam, an American with his own troubled past moves into the village. This story is set in Kenmare, Ireland. It portrays a tale of sadness, friendship, hope, love, loss, relationships and a close knit community. Mary needs to learn to trust and allow people into her life, Sam is successful in the music world but running from his dark past. The two have a mutual attraction but both refusing to acknowledge it. There is so so much going on in this story including child abuse, drink driving and child death which some readers may find hard to read. Overall it is a story of multiple friendships, small town gossip and people trying to deal with their past whilst dealing with current demons and secrets. McPartlin has a gift of writing a tale of relationships whilst infusing some humour, serious issues and bringing characters to life that are, some endearing and others loathsome. 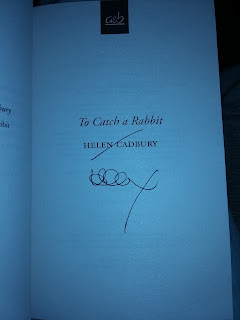 Whilst I did enjoy this one I don't think it has a patch on some of her other writing. 3/5 for me this time, I will be reading more by this author. Dodgers is a dark, unforgettable coming-of-age journey that recalls the very best of Richard Price, Denis Johnson, and J.D. Salinger. It is the story of a young LA gang member named East, who is sent by his uncle along with some other teenage boys—including East's hothead younger brother—to kill a key witness hiding out in Wisconsin. The journey takes East out of a city he's never left and into an America that is entirely alien to him, ultimately forcing him to grapple with his place in the world and decide what kind of man he wants to become. A fifteen year old gang member, East, has lost his drug house. In order to make it up to the boss, he takes on a job, to kill a witness with three other males. One being his younger brother Ty, always a law unto himself and two teenagers he hasn't met. With no credit cards, mobile phones and warned to avoid drawing attention to themselves, the boys set off on a journey that will change their lives. Firstly, let me say I am in the minority in not loving this book, the reviews out so far are glowing and speak highly of this tale. Sadly it was not for me, the youths in this book are given huge responsibility from the crime boss when the oldest boy is only seventeen. The gun totting youngster has been dabbling with violence and guns since possibly as young as eleven. This may well add authenticity to crime happenings in that part of America and therefore weight to the story, I found it really hard to click with. The boys know how big a deal the job is, yet cause quite a commotion on route and draw a lot of attention to themselves. This may add credence to the tale as they are young men battling for leadership among each other, each with a reputation. East is really the main character, despite his criminal background he cares for his mother and seems to long for a better relationship with his unruly younger brother. The job finds him going on a journey of who he is and who he wants to be. There is violence, murder, self examination and growth, crime, challenging behaviour and the main group frequently swear and use the N word to each other which some readers may find offensive. There are a few unexpected and surprising moments, one particular scene I didn't see coming and has quite an impact on young East. Colloquialisms from that area in America are also used making the dialogue between the characters, I found, hard going at times. Some of the terminology used and grammar I found I had to go over a few times to accurately get what the writer was saying. As I said though, so many people have enjoyed this story so I would urge you to give it a whirl if you have read and enjoyed similar books of this nature, sadly it just wasn't for me. 2/5 this time from me, thanks so much to RealReaders for providing me with an ARC of this in exchange for an honest review, Dodgers is available to buy from the 5th of April, 2016. Grandmother Ruth Sutton writes to the man she hates more than anyone else on the planet: the man who she believes killed her daughter Lizzie in a brutal attack four years earlier. Ruth's burden of grief and hatred, has only grown heavier with the passing of time, her avid desire for vengeance ever stronger. In writing to him Ruth hopes to exorcise the corrosive emotions that are destroying her life, to find the truth and with it release and a way forward. Whether she can ever truly forgive him is another matter - but the letters are her last, best hope. Firstly, let me say this book is written in letter format, the whole way through. 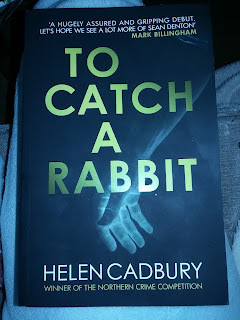 There are some dates but mostly they are just letters, more diary format as Ruth writes how she felt and what happened from the moment she finds out her daughter was brutally murdered. The letters clearly mark out, this is her getting her feelings out, her experience of it all and that she isn't expecting a reply. This is for her, to get it all down, in stages as she lives & relives what happened from finding out to the immediate aftermath. It has been four years since the murder, Ruth is still consumed with anger, grief, rage, hurt and many more emotions. This is her way of working through that and towards acceptance, by penning it all down to both the killer and us, the reader. When the murder is covered, after the autopsy, it is very detailed in the brutality to the body, some readers may find this hard to read. If you have lost someone to murder or even just death this could be a hard book for you to read as Ruth's grief and emotion very much comes alive on the pages. It is quite a weird one, not in the writing or anything but rather I haven't read anything like it before, or quite in that format. It is very cleverly put together, you can feel the raw emotion and devastation to the family, not just Ruth but to her grand daughter Florence, Ruth's ex husband and Lizzie's husband Jack. A gripping, emotive and sad story that draws you into from the very start to the very end. 4/5 for me this time, this is my first time reading this author and I would certainly read her again. Hearing footsteps pounding along the street behind him he glanced back, fleetingly worried, then laughed because the street was deserted. All the same, he felt uneasy. Everything looked different in the dark. Then he heard more footsteps approaching, and a hoarse voice called out. Turning his head, he made out a figure hovering in the shadows and as it raised one arm, the barrel of a gun glinted in the moonlight… The dead body of unassuming David Lester is discovered in a dark side-street, and DI Geraldine Steel is plunged into another murder investigation. The clues mount up along with the suspects, but with the death of another man in inexplicable circumstances, the case becomes increasingly complex. As Geraldine investigates the seemingly unrelated crimes, she makes a shocking discovery about her birth mother. A business man is killed, shot to death and robbed, another body soon turns up and DI Geraldine Steel is on the case. With a new boss and a list of suspects Steel has her work cut out for her, dealing with personal issues and a past that won't go away whilst making sure the team focuses on catching the right guy. Steel has a lot of issues going on in her personal life, however she does not allow this to cloud her judgment and pushes her colleagues to fully investigate all suspects and evidence. Her new boss has a lot to prove and his character is quite annoying at times as is her colleague Sam who is quick to make assumptions and judge. The pace of the story is relatively fast, a murder occurs within the prologue and the investigation kicks off immediately. We delve into Steels personal life as she has some closure on issues from previous books which opens up a potentially new can of worms. Sorry I know that is a bit vague but I don't do spoiler reviews and feel this needs to have a wee sentence to highlight it is addressed for fans of the previous books. This is a busy wee book, I have read one or two of this series and whilst you could get away with reading this as a standalone I would suggest reading the others as you get the full picture of current events & characters. The chapters are short & frequent, not everyone will enjoy this style but I personally love it. If you are busy and caught up with life you can sneak in chapters throughout the day, I read this in one sitting though, the old just one more chapter happened. There are twists and turns along the way, themes covering spouse abuse, family secrets, lies, betrayal and jealousy are only a few that are covered. Russell cleverly creates a tale of murder, police investigation and personal issues whilst trying to pursue the truth, uphold the law and fling in some surprises to keep the reader on their toes. I have previously enjoyed the Steel serious but preferred the Paterson ones, this book I really enjoyed hence firing through it. I look forward to the next in this series and think I will get the ones I have missed so far. 4/5 for me this time, thanks to RealReaders for providing me with an ARC in exchange for an honest review. Murder ring will be available for purchase from 26/05/16 from all good retailers, published by No Exit Press. 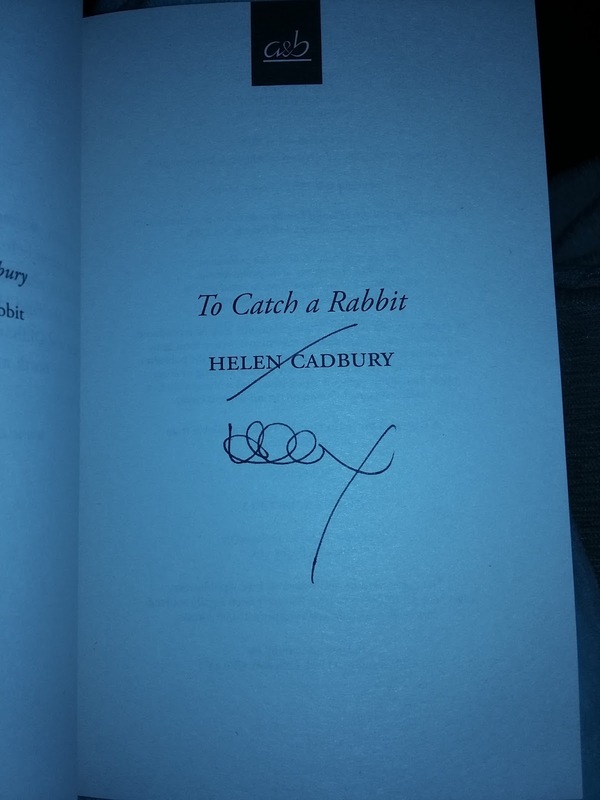 1 signed copy of To Catch A Rabbit by Helen Cadbury. This competition is open to the UK only. As always enter via the Rafflecopter below, the more entries you complete the more times your name is entered into the giveaway.